As a student, Cole had spent previous tax seasons assisting individuals with their tax returns. He enjoyed helping clients understand and navigate the various complex components, so they could better plan for the future. Cole continues to be interested in client service and is excited to continue to build relationships with clients. 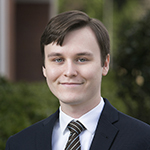 While most of his knowledge is with individual taxation, Cole is eager to become more experienced in assurance and entity tax. Cole is a University of Mary Washington alum and enjoys role-playing games and going to shows during his free time. The firm motto of “in your shoes” describes the way in which our firm goes about helping clients—we endeavor to guide and work for our clients as if we were in their positions, but with the knowledge and expertise of a CPA firm made up of dedicated accountants.